Movistar rider Xavier Tondo is a new hero of the anti-doping movement following his role in the recent police raids in Girona. 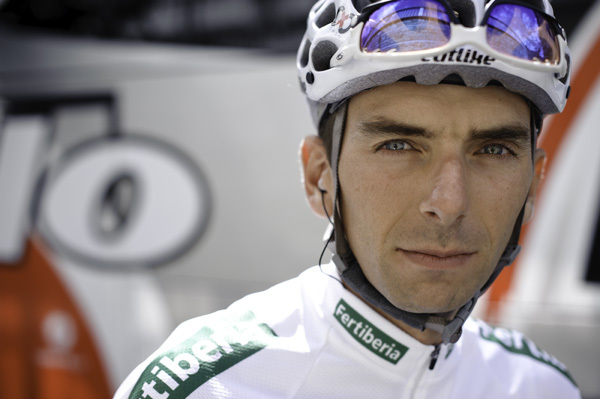 We interviewed the Spanish rider following his incredible Tour of Spain in 2010, for Cycle Sport November. “If the biological passport didn’t exist, I wouldn’t be sitting here talking to you now,” Xavier Tondo tells Cycle Sport. At 31, Tondo is a late bloomer. For years, since 2003 when the lanky Catalan first turned professional, he has clung to the very lowest rungs of the cycling ladder, in Spanish and Portuguese teams that barely registered with the UCI , let alone fans, before they disappeared. It was a pretty miserable existence, grinding from one tiny stage race to another from February to October, even if Tondo was fortunate in that he was regularly paid, with one exception. There was also the inglorious reputation of some of the smaller teams, particularly in Portugal. Tondo was competing against cyclists who were doped to the eyeballs. Nothing was ever proven, but the suspicion was impossible to shake off. Tondo found himself in a vicious circle where if he got good results, like when he took the Tour of Portugal in 2007, it would be automatically inferred he’d used drugs to get them. And if he got poor results, then he didn’t register on the radar at all. It was only when the biological passport started in Professional Continental teams in 2009 that Tondo – then in his single season with Andalucia-CajaSur – was able to prove the doubters wrong for good. A year later he was in Cervélo. Small wonder that last year’s first win – a superb stage victory in Paris-Nice, at the end of a long, lone attack in which he fended off the peloton by seconds – felt like a breakthrough for Tondo. But it was also the closing of a very long chapter in his career. “You know why I held my fingers wide apart as I crossed the line and made my victory salute at Paris-Nice?” he asks. After adding an eleventh win to his palmares in the hardest stage of the Tour of Catalonia, when he broke away with fellow Catalan Joaquim Rodriguez, then went on to take second overall, Tondo had a strong first fortnight in his first ever Giro. He was still lying third overall before the crucial Zoncolan stage. But then the Cervélo rider fell ill, cracked badly, dropped to the mid-twenties and eventually abandoned, two days before the end. Tondo was far from disappointed at his low key exit from the Giro. Given the glass ceiling that had prevented him from performing in high-level races has now disappeared, Tondo has a ravenous appetite to learn about events that other top professionals of his age have been racing in for a decade or more. Tondo is also unusual for a Spanish rider in other ways. While most are not interested in their bikes, he is a bike geek, obsessed with testing the latest material. 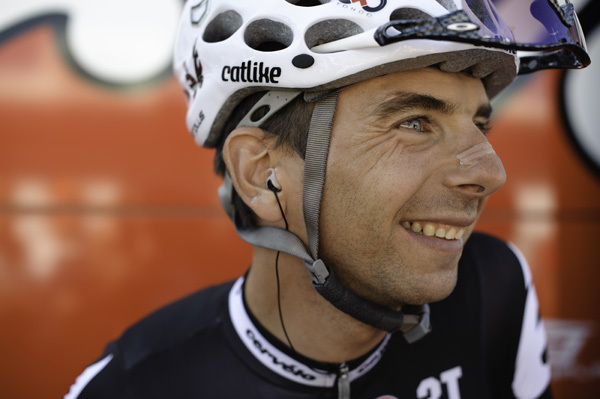 At Cervelo – built and marketed as a research squad – Tondo was, as he puts it, “in his element”. As part of his meticulous nature, he researches races obsessively. Long before the 2009 Tour of Spain, his first ever three-week race, Tondo had driven half way round Spain so he could check out all of the race’s main climbs, only to have to abandon, injured from two crashes, mid-way through. His hunger for advance knowledge of climbs has brought another benefit. Tondo was deep in Andalusia looking for one of the race’s most obscure climbs of the year, at Valdepeñas de Jaén, when he drove past Caisse d’Epargne’s director Eusebio Unzue. “We stopped to say hello, and I congratulated him on getting the deal with Movistar, which had just come out in the press,” Tondo said. “That was when we started to talk about me maybe signing with them for 2011.” Tondo subsequently signed a two-year contract with Movistar. Tondo has just completed a Grand Tour for the first time. At the Vuelta, he held fourth place into the third week, only falling away in the final stages. He still finished sixth overall – a brilliant achievement. “The first 10 days went brilliantly, it was the second part where I started to crack,” Tondo says. This year, there should be more. “Better late than never,” Tondo concludes. At the same time, if Pat McQuaid ever needed to justify the existence of the biological passport, he need look no further than Tondo’s case – and dozens of other riders like him. This is an adapted version of a feature that originally appeared in Cycle Sport November 2010.